My four year old daughter, Jailyn is absolutely in LOVE with 101 Dalmations and has been watching my childhood VHS copy over and over again for what seems like forever! Anyone could dress up as a Dalmation but I had never seen anyone as little or as adorable as her dress up as the evil Cruella herself! They do NOT make that costume for small children soo I put the pieces together myself by studying scenes from the movie. 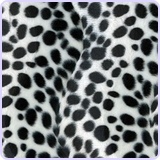 I found the dalmation print and my great friend at Bee's Bowtique made the wrap for me! She was a total hit and it was soo much fun to do together! I LOVE this!!!! I've been already thinking about why to dress my kids as for Halloween and I want to do Cruella for my 3 yr old daughter and dress my little boy as a Dalmation. This is a total inspiration! This is totally cute! 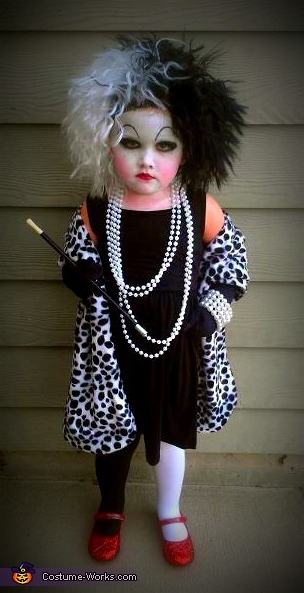 my daughter really loves 101 dalmations and wants to incorporate this into pageants :) great idea! Love this! Are they instructions for this? Would love to know how the hair was made. Yes, do tell about the hair!! I LOVE this! This is the most creative and adorable costume I've ever seen. Def making this for my 3 year old!! First off, here is the link for Bee's Bowtique! I am so excited for people to try this out! It was seriously the biggest hit in our neighborhood! She kept up that signature Cruella scowl the whole night too!! Soo this is how I made it! Everything was purchased individually and put together! I bought a simple sleeveless black dress from Target right around this time last year! Clearance rack, super cheap find! The shawl was of course made by Bee's Bowtique! Her makeup was a a simple white clown make up kit found at WalMart (along with the red lipstick) -- and I used my black eyeliner for her brows and blush for her cheeks! 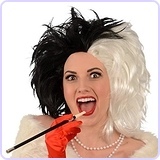 The WIG was the BEST find -- it's actually a Cruella wig and I found it at WalMart! I think I paid around $10-$15 dollars for it! SN: My child has always had a uh, larger head and it fit just right! Not too tight so no itching and not too loose, it stayed put all night! The jewelry is also from Walmart -- part of a "flapper girl" accessory kit we had left over from Halloween a couple years ago! But you could use whatever you had around the house, I'm sure!! I hope you all give this a try!! I'm excited to think about what my crazy Cruella will be this year!! 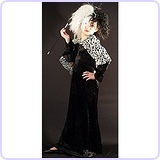 Why would you sell a child's costume that includes a cigarette holder? Light(en) up, mamadawn. It's not like it's a real cigarette! Did someone really comment about the cigarette? Ahahahaha. It's Halloween, it's PRETEND. Many, many costumes wouldn't necessarily be "right", like zombies, blood on the face, etc. It's called "make believe"=) LOVE this and my daughter is going to be just this for Halloween. We already have the wrap, found it on eBay! I'm trying to do this for my daughter for Halloween and the only thing I can't figure out is the wig!! How on earth did you get that? #mamadawn -- This is the mother of this sweet scowling Cruella DeVil. 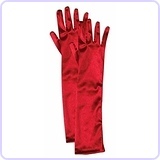 It's a plastic accessory that was sold as part of a Flapper Girl costume that we adapted for this outfit. I see no difference between this and a Ninja carrying a plastic sword or a cowboy yielding a plastic gun. It's make believe and my daughter knew it as a wand and carried it as such. Please if you have nothing nice to say, don't say anything at all. This is a child and this is a Halloween costume -- nothing more, nothing less. Carrie, I love that you stood up for yourself and your daughter without being hateful or ugly. I don't see that enough in this world. I am also putting this awesome costume together for my 6yo neice. She can't wait for Halloween! And I am looking forward to seeing what your little one will be this year. This coustume is adorible!! !The only thing is I dont know what to do for hair,and I dont have a wig!! !What should i do???!!! Carrie, would you be interested in selling the costume?? Would love it for my 4 year old . She is adorable!! May I post this link and photo on my website? What did you use for the black "cigarette"??? Tensie! It was part of a 'Flapper Girl' costume dress up set! 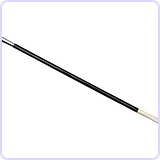 You could use a wand as well or omit it completely! Again sorry for the late response! I would love this outfit for my granddaughters Halloween outfit.,what do I need or where can I order it?